Where has the season gone? 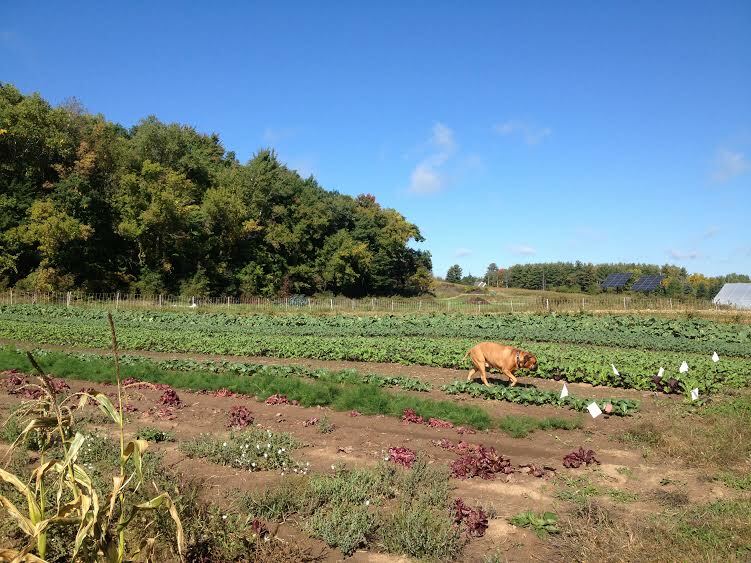 It seems like just yesterday that we were harvesting spring lettuces and radishes, seeding beans every other day, and scrambling to fight the rain and the weeds. Now we’re facing only three more boxes after this week is over! 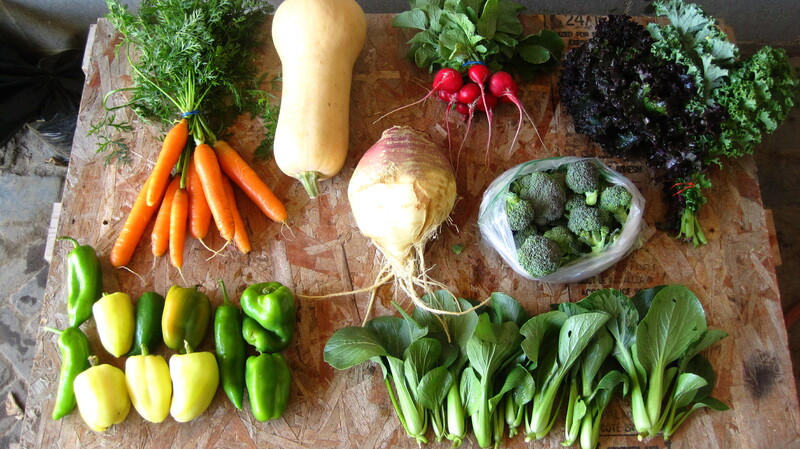 We’re seeing a steady progression into fall now-there’s some type of winter squash scheduled into every box from now on, we’ve taken down all the dead tomato plants, the greenhouse is getting closed up for the winter, and we find true fall and winter root vegetable crops like rutabaga and carrots in the boxes. Brandon’s parents came out for a quick weekend visit from South Dakota again, and we couldn’t have enjoyed them more. Lois showed up with a home-made apple pie, (always a good idea!) they helped us harvest and pack boxes on Monday, and they even got our temporary greenhouse torn down. Thanks so much, Richard and Lois, we couldn’t have gotten through some of these weeks without you! We’ve been having a big gopher attack this month, and it turns out that our fabulous new employee Michelle counts gopher-trapping among her many talents. Hopefully this will help reduce some of the damage that some of the squash and root crops are experiencing. It hasn’t been too serious of a problem yet, but we’d love it if the gophers would move over to the DNR land next door and leave the veggies to you guys! A word about the boxes this week and next: We’re doing a bit of a shuffle with small share box contents for this week and next. 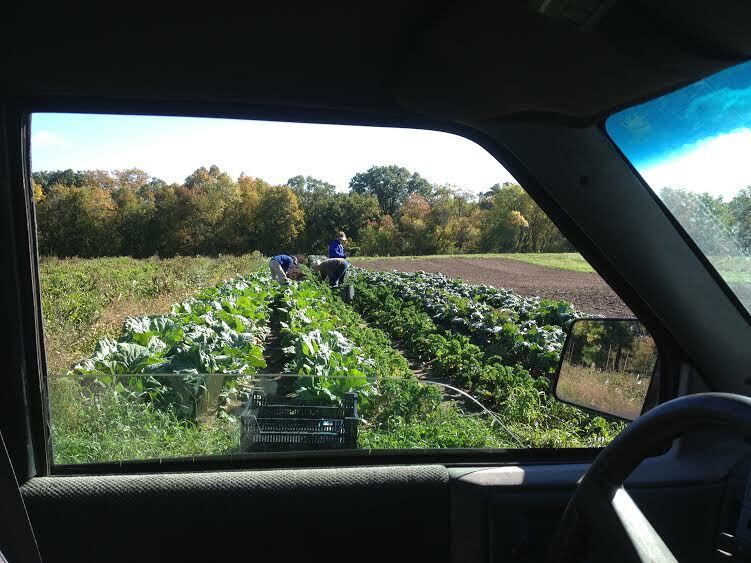 Despite planting over 300 cauliflower for this fall, they are maturing in small spurts instead of all at once. This gradual maturation is a common characteristic of heirloom varieties and is a major reason why many larger commercial growers have turned to hybrids-they really need dependable harvest dates. Since we enjoy the ability to customize our boxes on a weekly basis according to what’s actually ready, tasty, and beautiful, we often choose to grow the heirlooms which can be superior in taste and appearance. To make sure our small share members get the best chance of getting one in their box this season, we are including them on Thursday of this week and Tuesday of next week. The bottom line? Between this week and next small shares should all see a beautiful Purple of Sicily cauliflower in their boxes! Another note-we were planning on putting the butternut squash in a later box, but the light frost we experienced last week caused a little bit of damage to them, as they have the most delicate skins of the squash we grow. What you might notice is a little bit of discoloration in the skin color, which often appears as if it’s wet. There is absolutely no damage to the squash’s flavor, but we wanted to get them out to you sooner rather than later since they’ll be more likely to soften sooner. If you keep them in a cool, dry place and eat them within a week or two they should be just fine. Butternut is one of the most beloved of all squash for their sweet flavor and abundance of meat, so we’d be surprised if yours sticks around that long! All the other winter squashes should keep like usual, so depending on storage conditions you’ve got months to enjoy them. Butternut Squash- 1 squash per member! Carrots-1 1/2# bunches for all members! Kale-these frilly beauties are from our second succession, and will continue to produce throughout the winter. We’ve included Redbor which is a deep purple (go phytonutrients! ), Vates which is a deep green, or a combination of both. 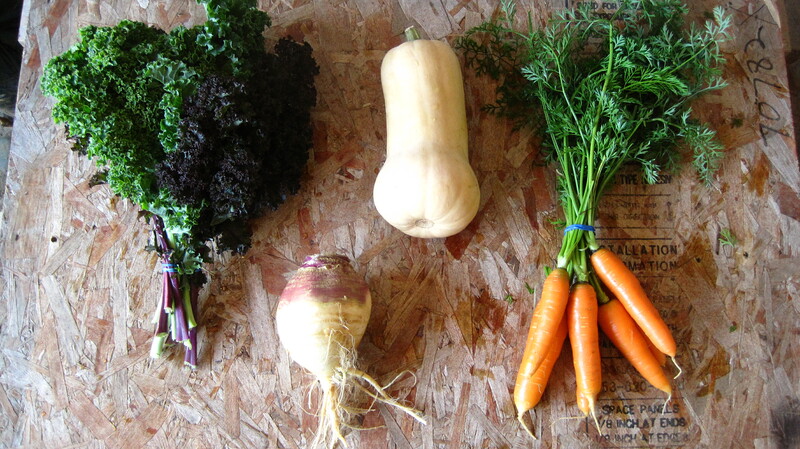 Rutabaga-the giant, ugly, misunderstood member of the root vegetable family. They look like a lumpy turnip, but peel them, roast or mash them, and enjoy them with seasoning like butter, cream, thyme or rosemary and you’ll fall in love with these giant misfits! They have a taste that’s like a cross between a carrot and a potato, with a texture like a carrot or turnip. They’re also rather rudely known as Swedes as they were long a staple crop for poor Swedish farmers. When Heather and Brandon go to her adopted Larson family’s home for Thanksgiving and Christmas meals, mashed rutabaga is one of the most anticipated dishes on the table! Cabbage-we continue to be in awe of the cabbage this year. The variety you’re getting is called Deadon. Terrible name, gorgeous vegetable. They have grown well, sized up nicely, and are stunningly colored with green and purple. Baby Pac Choi-full shares will enjoy this delicate Asian vegetable this week. Some shares saw pac choi this spring, too. They enjoy the cooler weather of spring and fall, and are a welcome addition to the boxes this week. Peppers-Full shares also get to enjoy the very last of the bell peppers this week. Goodbye, summer! Watch out! Heather learned to drive the John Deere about 5 minutes before this photo was taken. What a trusting family! 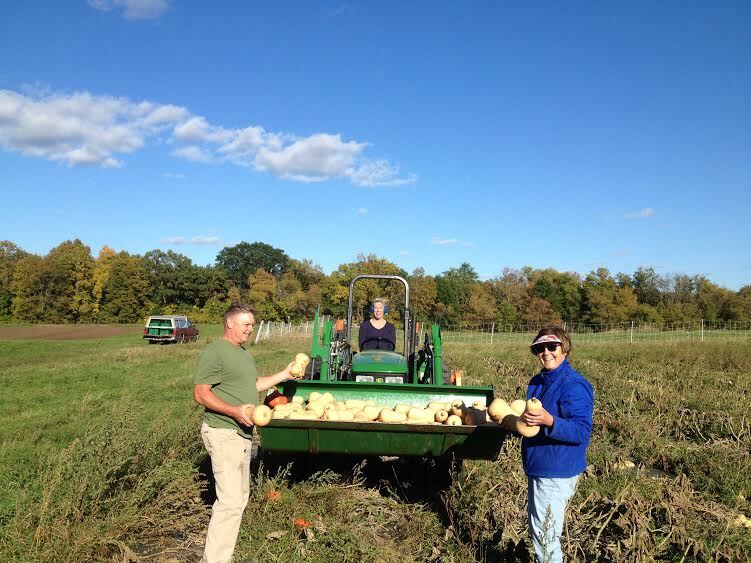 Richard and Lois are helping bring in the squash harvest. Frank on the prowl for discarded radishes, one of his favorite treats. 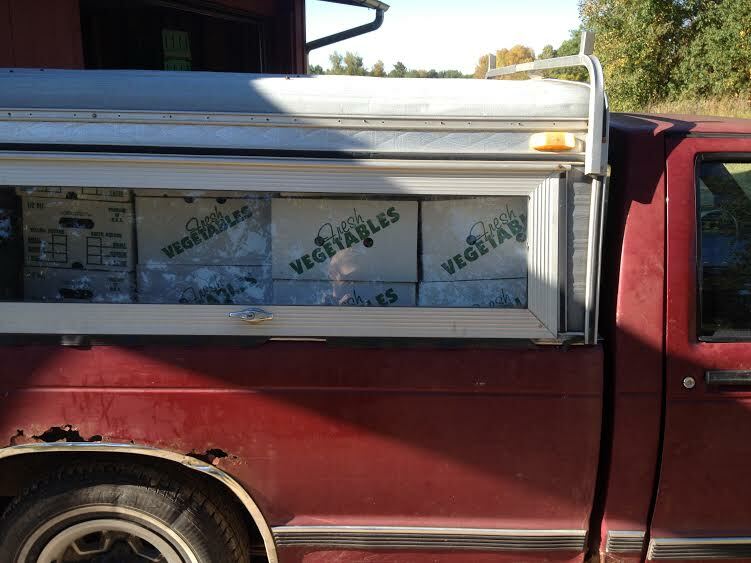 Boxes loaded up and ready to go to the warehouse of the Hungry Turtle Farmer’s Cooperative in downtown Amery. The co-op is who we and several other farmers hire to deliver our boxes in the Twin Cities twice a week. Both of these recipes are from Nigel Slater’s famous vegetable cookery book, Tender. If you don’t have it, it’s probably the most valuable CSA member cookbook I can think of! Peel the rutabaga. Cut the flesh into large chunks and pile into a steamer basket or metal colander. Place over a pan of boiling water and steam for 12-15 minutes, or until tender. (Rutabaga will always have a certain amount of firmness to their consistency, but it should taste done). Put into a bowl and crush with a potato masher. Fold in some butter, salt and black pepper and beat hard with a wooden spoon. This roast is one of the most pleasant ways to enjoy the goodies that are in your boxes this week and in the coming weeks. You will see celeriac, beets, rutabaga, and carrots in your futures, so keep this recipe around for the duration of the season! 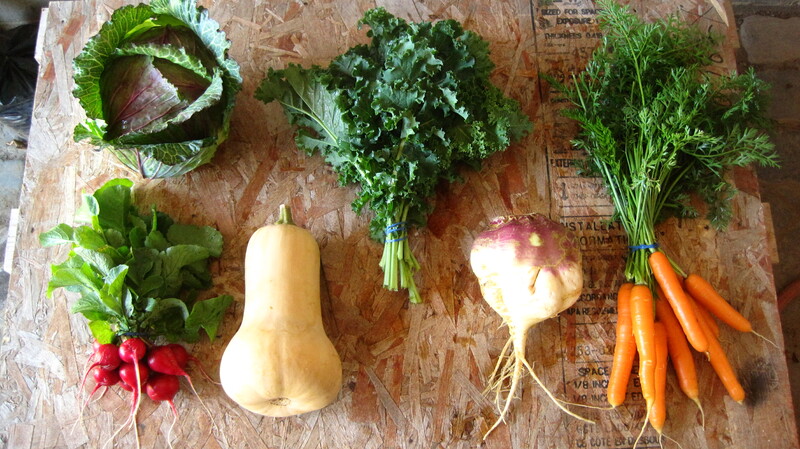 Peel and chop an assortment of rutabaga, pumpkin or squash, carrots, beets celery root or turnips. Any root will do. Bring a large pan of water to a boil, add all the vegetables except the beets, and let them simmer for ten minutes. They should just take the tip of a knife. Drain. Pre-heat the oven to 350 degrees Fahrenheit. Warm up plenty of butter (5 tablespoons for every 4 pounds of veggies) in a roasting pan with a good glug of olive oil to stop it burning. Add the drained vegetables and beets, if using, turn them in the butter, and scatter with any herb you like (probably thyme or rosemary) and a few squashed cloves of garlic. Roast 45 minutes to an hour, until the vegetables are soft inside, crisp and golden without.